We all want the best for our children. That is why I am a strong advocate for doing research and understanding what is right for your kids. There are so many out there that feel they know what is right, and believe me I’m often the same when it comes to me, my children, and my family. There are also, however, so much misinformation out there about different topics. Researching and understanding what is truth, what is based on real research and what is exaggerated is very important when it comes to our children’s health. I am by no means a holistic, “crunchy” mom. Do not even ask me where that term came from, I do not know and do not really care. If you identify as a “crunchy” mom I give you respect. We all have our own beliefs. Many do childbirth without drugs, I did the second time but not because I was against it, because it didn’t work the first time. Many want holistic, natural remedies for their children, and I agree. I’d rather not put too much medicine in them if I can help it, but if my child has a fever Tylenol every once in awhile is not going to hurt. It never has to my children before. I am however not a fan of the misinformation out there about vaccines. My children are fully vaccinated for their age and they will always be staying on the suggested calendar to vaccinate. Because I want my children to be safe AND I want to not risk other lives because of my children either. Before I continue lets look at some of the information put forth by those against vaccinations. There are many arguments against vaccines but here are many common arguments (myths)…. Better hygiene and sanitation are actually responsible for decreased infections, not vaccines. I’m only going to discuss a few of these. I know many mother’s of children with Autism. I know that many, if not all, of those mother’s would say, a child with autism is well worth it rather a child dead due to a preventable disease. Vaccines do not cause Autism. But what concerns me here is the stigma put on those with ASD. Why is Autism feared to the extent that people would risk not only their own child’s lives but so many other lives out there. (We’ll get to how not vaccinating your children risks other children). One article started this fear of Autism due to vaccines. It was a study published in 1997 by Andrew Wakefield. This study suggested that the MMR vaccine caused Autism. The paper and this study have been completely discredited. There are new studies that suggest that Autism starts in utero. Dangers of this approach out way any supposed benefits. 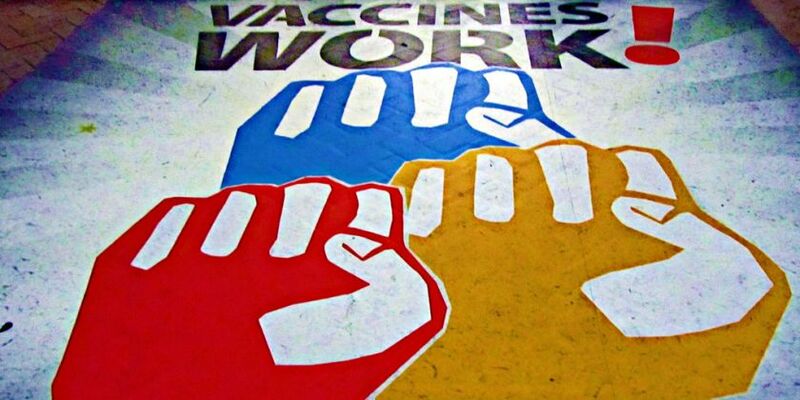 Diseases like Measles, Polio, and Rubella have been all but obliterated since the implementation of vaccines. Before the vaccines of Measles, for example, the vaccine was developed in 1963. Before that vaccine close to 500,000 cases of measles were reported to the CDC. 450-500 deaths, with the rise of anti vaccination movement the deaths reported in 2004 were 37 in 2014 there were 667. Polio caused death and permanent paralysis. This paralysis caused many to live out their entire lives in an iron lung, a machine to breath for them. This man still spends much of his time in an iron lung today due to the polio virus he contracted. The polio vaccine was introduced in 1955 when there were 13,000 cases of polio that year. No matter the arguments against vaccines for your own children. I do understand the urge to protect your child. I really do. With so much misinformation out there I also understand the confusion that can ensue. How do you know what to trust? What I also know is vaccinating our children is not only for my children, it is for the community as a whole. The herd immunity we build in a community protects those around us unable to fight diseases and those unable to get vaccines. Many people with compromised immune systems are unable to get vaccines. This includes people with cancer, HIV/AIDS, type 1 diabetes, and many other illnesses. This also includes babies too young to vaccines. This article tells of a 10 month old who had a heart defect and was not old enough to get the Measles vaccine. The child contracted Measles from someone who had not received the vaccine. The child died. What is the greater cost? 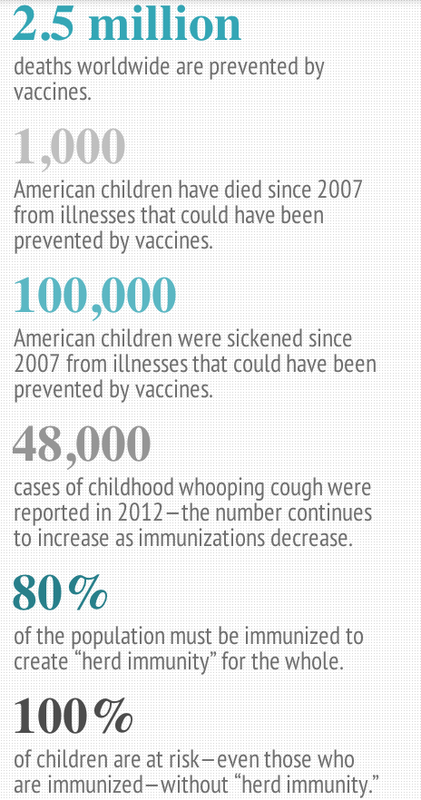 The greater cost of not vaccinating isn’t just the possible risk of your own child’s health. The greater risk is putting other children, adults, seniors at a great risk of illness and death as well. This is why my children are vaccinated and will continue to be vaccinated based on the suggested schedule in the United States. I do not fear for just their wellbeing. I fear for the wellbeing of those my children interact with. I fear the illnesses the vaccines prevent. I fear death over anything else. Yes. Yes, yes, yes, yes, YES! I try to not get too political in the mommy world because I honestly believe we are all trying our best to do the best for our babies (generally speaking, anyway) but this is a topic I CANNOT let go. Vaccinations are absolutely necessary and SO vital to our children’s health. I love the points you brought up and I completely agree. I’m definitely going to be sharing this one! Thank you so much for writing about such an important topic! 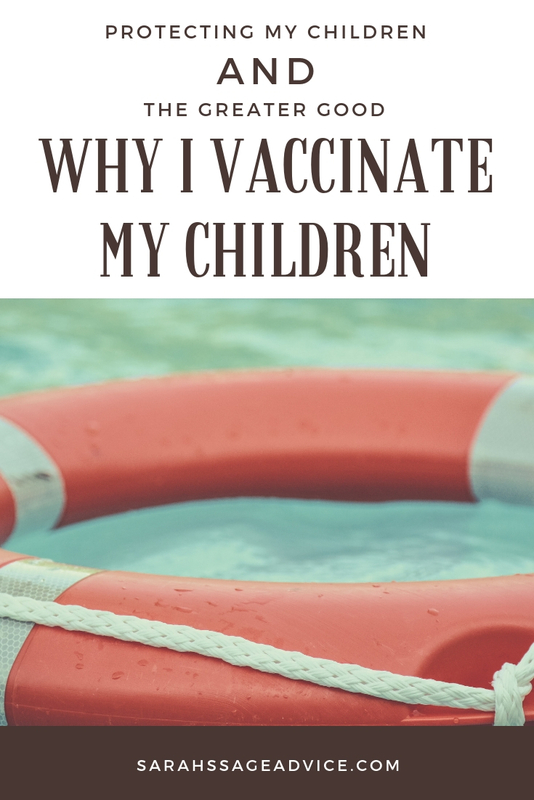 I try to stay away from this topic because there are people who are vehemently anti vaccine. I prefer to vaccinate my child. He has all of his shots, which were done on the recommended schedule. A few of my friends are semi crunchy and don’t always advocate the vaccination schedule. I can understand their concerns but the risk is too high for me.